Hell hath no fury like a privileged white gay man who has waited too long for the next pride parade contingent to sashay by. 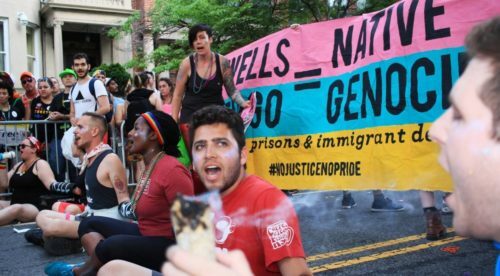 When #NoJusticeNoPride blocked the DC Pride parade route on June 10, causing an hour delay to an already epic three-hour parade, you could hear the ice cubes impatiently rattling in Bloody Mary glasses for blocks. Revelers at three locations on the route were forced to contend with (mostly black and latinx) protesters, women and trans folks among them, shouting chants about how DC Pride was beholden to corporations and institutions and a police state that do not have their welfare in mind. But let’s set aside their message for the moment, since it hardly mattered to angry parade attendees anyway. What infuriated them most was the timing and location for such an action, disrupting the flow of hunks and baby strollers and such. Protesters really should do their best to be, you know, obedient. They weren’t. And this is why we can’t have nice things. The Stonewall riots were not particularly well-timed either. Those rioters – also mostly people of color, also including gender-bending outcasts – displayed the fury of years of being marginalized, discounted and mistreated. The parallels, between then and now, are plain to see, and just having to type that sentence makes me wish LGBT history were taught in schools – or shared among us, at the very least. 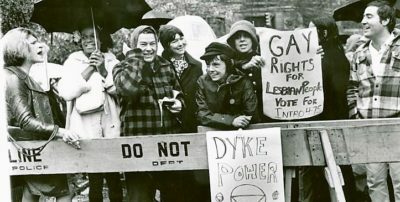 Stonewall instigators Silvia Rivera (far left) and Marsha Johnson (with umbrella) protesting for 475 – a comprehensive LGBT rights bill – which followed the Stonewall Riot in 1971 and 1972. With a couple of days to give thoughtful consideration to the event, offended parade attendees flooded comment sections online, which is of course the perfect place to make your privilege most widely known. After first misidentifying the protestors as Black Lives Matter because, well, all those brown-skinned arms waving around look alike, the crowdsourced idiocracy posed some deeply clueless questions. Why didn’t these trouble makers try working within the DC Pride organization? They did. Why did they have to do this at the parade? Because it worked. Why don’t they just start their own Pride event? Because they still maintain a shred of hope for your humanity. I looked upon the protest with admiration and nostalgia, because an AIDS war horse like myself doesn’t get to witness old-school activism so much anymore. When I pointed this out to commenters, that the #NoJusticeNoPride action reflected a time when gay white men like myself felt obligated to take to the streets, the indignant responses came fast and furious. “But we were dying!” came one ill-considered retort. Yes, my darlings, we were. Like the weekly and sometimes daily murders of black trans women these days. Like the justified, mortal fear that people of color have of the police, who lined the parade route in uniform like an unspoken taunt. Peter Staley knows a thing or two about street protests, given his iconic status as an ACT UP veteran and star of the Oscar-nominated documentary, How to Survive a Plague. He’s also gay and really white, so maybe you’ll listen to him. “We really pissed off the gay intelligentsia,” Peter told me about early ACT UP days, referring to those who are appalled that #NoJusticeNoPride would dare target our own. “William F. Buckley suggested people with HIV should be tattooed, while his wife, Patricia, was a philanthropist who was doing AIDS benefits.” ACT UP protested at an event she was chairing because she would not repudiate her husband’s vile comments. 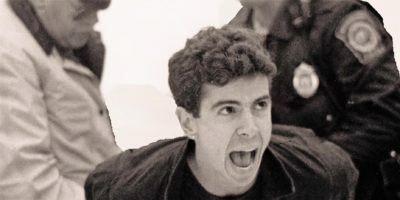 Peter Staley in classic ACT UP mode, at a pharmaceutical protest in 1989. Oh my. AIDS activists targeted “their own” at an AIDS benefit during the worst of the epidemic. And yet LGBT civilization somehow remains, aside from reality programming on Logo. My favorite string of online hysteria thus far has been the warnings that #NoJusticeNoPride is dividing us, which is exactly what conservatives want, and our internal conflict will lead to election disasters and global warming and the death of Meryl Streep. So take heart, everyone. The system of speaking out and acting up is secure and even beneficial. And Peter has an even more philosophical point of view that deserves to be the final word.